Joyce Samuel garnered 262 points for the crown while former champs Alexandrina Maduro, placed second with 244. Lenora Delville's second place finish in the Sr. Girls Sprint Medley Relay to Ivan Dawson's fifth place finish, separated them by one point, 229-228 heading into the meet's final race, the Sr. Boys Sprint Medley. Dawson who needed to finish two places ahead of Delville, followed Delville in fifth place and wound up fourth behind Delville's 230 score with 229. Virgin Gorda's Robinson O'Neal had 168 points to finish fifth with Isabella Morris' 136 occupying sixth place. First Impression were seventh as the the last team getting over the 100 points plateau with 118. Jost Van Dyke scored 91 to finish eight while Pelican Gate amassed 61 and Anegada's Claudia Creque, 51. Century House Montessori rounded out the scoring with five points. Like the A Division, there was stiff competition for the top spot. The respective Division winners were as follows: U9 Girls: Sielle Cockburn of Lenora Delville 22 points. Boys: (tie) Kyle Farrington, Robinson O'Neal and Diangelo Simmonds, Isabella Morris, 13. U11 Girls: Anjanique Cheltenham, Joyce Samuel, edged Shawanelle John of Alexandrina Maduro, 26-24. Boys: Delano Hodge, Ivan Dawson, 30. 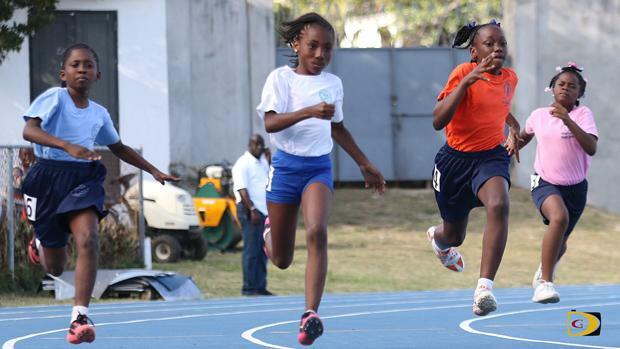 U13 Girls: Kieanjah Roberts, Joyce Samuel, 30. Boys: Khybah Dawson, Alexandrina Maduro, 30. 13+ Girls: Erisha Bobb, Lenora Delville, 30. Boys: Malaki Smith, Isabella Morris, 30. Victor Ludorum: (3-way tie); Delano Hodge, Ivan Dawson, Khybah Dawson, Alexandrina Maduro and Malaki Smith, 30. Victrix: (tie); Kieanjah Roberts, Joyce Samuel and Erisha Bobb, Lenora Delville, 30.